Student Senate President Joseph Maynard announced that the University of Rhode Island might not have any reading days due to the number of classes missed due to the snow. It has already been decided by the Faculty Senate that the first reading day on Thursday, April 30, will be a Monday schedule. Now it must be decided whether or not the following Friday, May 1, should be held as a Tuesday schedule and Saturday May 2, as a Wednesday schedule. Not having reading days can put students at a disadvantage. “If Friday and Saturday are taken away, then there is only Monday left to learn new material,” said Student Senate representative Lauren Kidd. Having a Saturday class can also raise concerns for students with jobs, both off and on campus, who may not be able to get the day off. The Faculty Senate will have a meeting today in the Cherry Auditorium at 3 p.m, to discuss the bill. Everyone is welcome to express their concerns on having a Saturday class and the risk of loosing reading days. Maynard expressed that students need to express more than just the fact that they do not want to go to class on Saturday. “I think students coming to the meeting will send a message even if it’s not verbal, that we are actually passionate about this, there are also other complications in the University handbook, that we will bring up” he said. “Let’s blow up the faculty senate room and let them know that we want our reading days and that we don’t want a Saturday class,” said Student Senate representative Phyllis Pasquale. 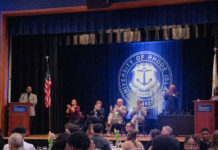 URI Student Senate recognizes the organization Aero Space as a Senate-funded group. The group focuses on certifying private pilot licenses and welcomes anyone that is interested.